Chalivendra, V.; Hong, S.; Arias, I.; Knap, J.; Rosakis, A.; Ortiz, M.
A well-controlled and minimal experimental scheme for dynamic fracture along weak planes is specifically designed for the validation of large-scale simulations using cohesive finite elements. The role of the experiments in the integrated approach is two-fold. On the one hand, careful measurements provide accurate boundary conditions and material parameters for a complete setup of the simulations without free parameters. On the other hand, quantitative performance metrics are provided by the experiments, which are compared a posteriori with the results of the simulations. A modified Hopkinson bar setup in association with notch-face loading is used to obtain controlled loading of the fracture specimens. An inverse problem of cohesive zone modeling is performed to obtain accurate mode-I cohesive zone laws from experimentally measured deformation fields. The speckle interferometry technique is employed to obtain the experimentally measured deformation field. Dynamic photoelasticity in conjunction with high-speed photography is used to capture experimental records of crack propagation. The comparison shows that both the experiments and the numerical simulations result in very similar crack initiation times and produce crack tip velocities which differ by less than 6%. The results also confirm that the detailed shape of the non-linear cohesive zone law has no significant influence on the numerical results. Chalivendra, V. [et al.]. 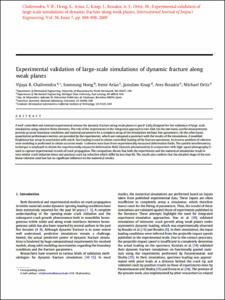 Experimental validation of large-scale simulations of dynamic fracture along weak planes. "International journal of impact engineering", Juliol 2009, vol. 36, núm. 7, p. 888-898.